Visit Tucson invests hundreds of thousands of dollars annually to sponsor and market area events. Events add to our quality of life and can help attract visitors from across Arizona, the region, and in the case of the Tucson Gem, Mineral & Fossil Showcase, from throughout the world. 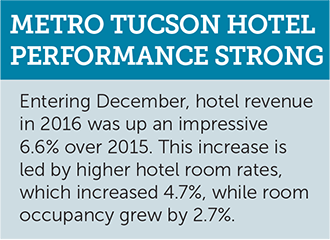 Attracting more visitors to events increases travelers’ direct expenditures in metro Tucson, while helping all of us by adding their tax dollars to our local and state coffers. As the primary destination marketing organization for Tucson and southern Arizona, Visit Tucson is charged with bringing travelers and their dollars to our region. Events have become an increasingly important tool in fulfilling that mission. We invest in events that have a solid plan to grow visitation or participation from outside southern Arizona. The Gem Show, Tucson Festival of Books, Tucson Rodeo, All Souls Procession, Tucson Invitational Games, Tucson Association of Realtors Soccer Shootout and El Tour de Tucson are a few of our established events that, on their own, attract thousands of visiting buyers, spectators or participants. Meanwhile, the Tucson Conquistadores Classic, a PGA TOUR Champions event, attracts primarily a local audience, but provides Tucson with more than a dozen hours of live and replay coverage on the Golf Channel. Course signage, commercials and announcer mentions about Tucson provide positive national media coverage we cannot afford to buy on our own. We are also fortunate to have several events, which can attract more out-of-towners as they grow. 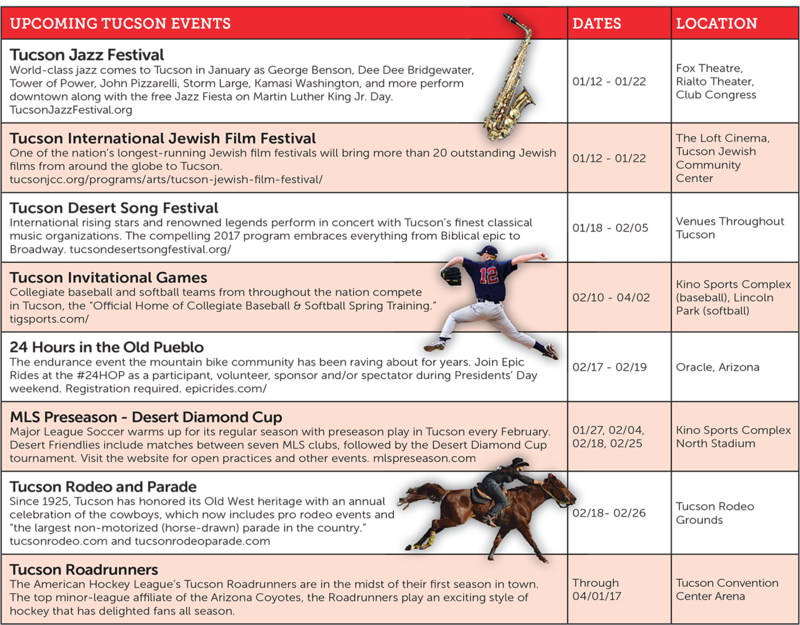 The Tucson Jazz Festival, NOVA® Home Loans Arizona Bowl, Vamos a Tucson Mexican Baseball Fiesta, Tucson Rodeo Parade, Major League Soccer Preseason-Desert Diamond Cup, the Arizona Distance Classic and Film Fest Tucson are among those activities in which we invest that we believe can bring more visitors and participants to Tucson. While many events have been left out due to space here, we encourage you to take part in these events. 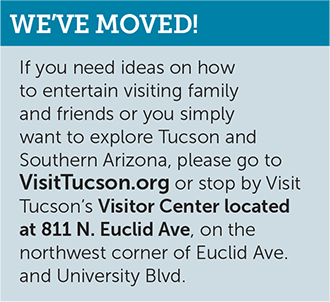 You can find a comprehensive list of regional activities at VisitTucson.org/events. In addition to promoting the Gem Show, our team takes the lead in working with owners, operators and exhibitors to ensure they are connected to the City of Tucson and/or Pima County to handle any logistical issues that arise. We also collaborate with Park Tucson to promote the free GemRide shuttle that transports thousands of customers annually among the shows. This year’s Gem, Mineral & Fossil Showcase will take place January 28 – February 12, 2017. For more information, visit TucsonGemShow.org. Go to VisitTucson.org to find our full calendar of local events along with other great things to do throughout Tucson and Southern Arizona.